When I read old books, I like to look for predictions of the future. Since we are living in that future, it is fun to see how they did. Case in point: I have a copy of “The New Wonder Book of Knowledge”, an anthology from 1941. This was the kind of book you wanted before there was a Wikipedia to read in your spare time. There are articles about how coal is mined, how phonographs work, and the inner workings of a beehive. Not the kind of book you’d grab to look up something specific, but a great book to read if you just want to learn something interesting. In it there are a few articles about technology that seemed ready to take us to the future. One of those is the Televox — a robot from Westinghouse poised to usher in an age of home and industrial mechanical servants. Robots in 1941? Actually, Televox came into being in 1927. If you were writing about the future in 2001, you might have pictured city sidewalks congested with commuters riding Segways. After all, in 2001, we were told that something was about to hit the market that would “change everything.” It had a known inventor, Dean Kamen, and a significant venture capitalist behind it. While it has found a few niche markets, it isn’t the billion dollar personal transportation juggernaut that was predicted. It’s a problem every maker faces at one time or other – how to organise the ever-growing mass of components in the workshop. Some give up and just live with box upon box of disordered parts. That wasn’t good enough for [Inventor22], though – who created FindyBot3000 to tackle the job. The first step is to source a set of those tiny component drawers we all know and love. These are then combined with WS2812B LED strips, which act as indicators for each individual drawer. A Particle Photon is used as the brains of the operation, and drives the strips. So far, so good. Of course, blinking LEDs are great and all, but it’s the voice control where things get really interesting. Through Google Home and IFTTT, it’s possible to give commands to the Particle Photon. This can be used to manage the parts in the drawers, as well as to quickly highlight the location of various components. It’s backed up with an Azure backend, which manages the component database and keeps track of everything. It’s a tidy build that does away with tiny sticky labels, and is reconfigurable on the fly as parts come and go. Of course, if you’re mostly storing SMD parts, you might prefer a reel based solution. Video after the break. An oscilloscope is a device that many of us use, and which we often have to use while our hands are occupied with test probes or other tools. 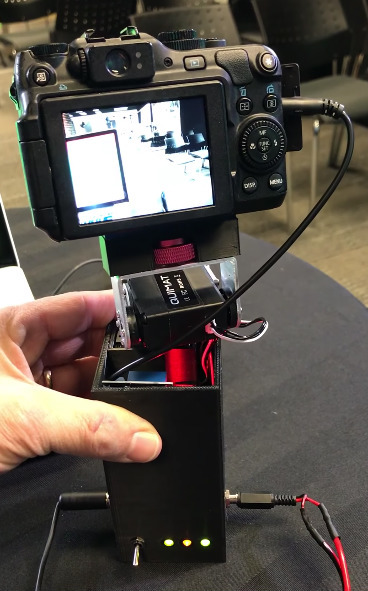 [James Wilson] has solved the problem of how to control his ‘scope no-handed, by connecting it to a Raspberry Pi 3 running the snips.ai voice assistant. This is an interesting piece of software that runs natively upon the device in contrast to the cloud service provided by the likes of Alexa or Google Assistant. The ‘scope in question is a Keysight 1000-X that can be seen in the video below the break, but looking at the Python code we could imagine the same technique being brought to other instruments such as the Rigol 1054z we looked at controlling via USB a year or two ago. The use of the snips.ai software provides a pointer to how voice-controlled projects in our community might evolve beyond the cloud services, interestingly though they do not make a big thing of it their software appears to be open-source. Oscilloscopes do not have to be remotely controlled by voice alone. It seems to be a common desire to take measurements no-handed — one project we’ve featured in the past did the job with a foot switch. After a hard day of soldering and posting memes online, sometimes you just want to yell at the blinking hockey puck in the corner and have it pour you out a perfectly measured shot of your favorite libation. It might not be the multi-purpose robot servant we were all hoping to have by the 21st century, but [Jake Lee] figures it’s about as close as we’re likely to get for under fifty bucks or so (Jake’s security certificate seems to have expired a few days ago so your browser may warn you, here’s an archived version). From the hardware to the software, his Alexa-enabled drink pouring machine is an exercise in minimalism. Not that there’s anything wrong with that, of course. The easiest solutions are sometimes the best ones, and we think the choices [Jake] made here strike a perfect balance between keeping things simple and getting the job done. It’s by no means the most complete or capable robotic bartender we’ve ever seen, but it’s perhaps the one most likely to be duplicated by others looking to get in on the voice-controlled drinking game. So how does it work? 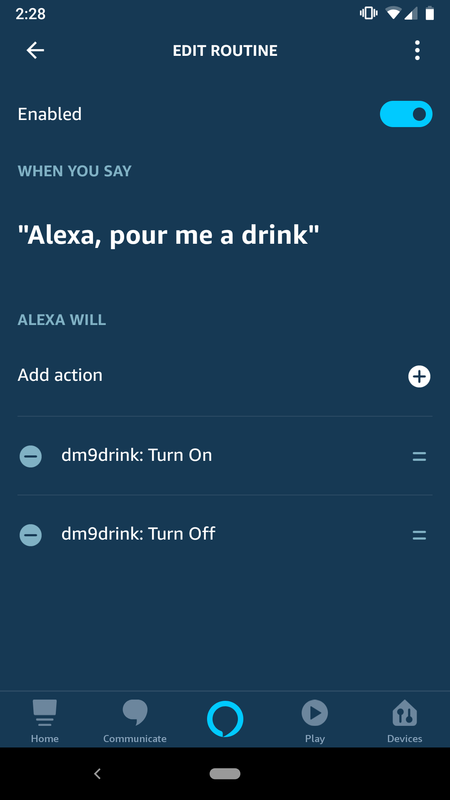 For one, [Jake] didn’t go through the trouble of creating a “proper” Alexa skill, that’s quite a bit of work just to pour a shot of rum. Instead, he took the easy way out and used the FauxMo library on his ESP8266 to emulate a few WeMo smart switches. Alexa (and pretty much every other home automation product) has native support for turning these on and off, so with the proper code you can leverage it as an easy way to toggle the chip’s digital pins. Using the Alexa’s “Routines” capability, these simple toggles can be chained together and associated with specific phrases to create more complex actions. For example, you could chain the dispensing alcohol, lowering the room lighting, and playing music all to a single voice command. Something like “I give up”, perhaps. When Alexa tells the drink dispenser to turn on, the ESP8266 fires a relay which starts up a small 12 V air pump. This is connected to the bottle of rum though a glass tube that [Jake] bent with a blow torch, and starts to pressurize it. With the air at the top of the bottle pushing down on it, a second glass tube gives the liquid a way to escape. This method of dispensing liquid is not only easy to implement, but saves you from having to drink something that’s passed through some crusty eBay pump. If you prefer the “right” way of getting your device talking to Amazon’s popular home surveillance system, our very own [Al Williams] can get you headed in the right direction. On the other hand, if the flowing alcohol is the part of this project that caught your attention, well we’ve got more than a few projects that cover that topic as well. We live in the future. You can ask your personal assistant to turn on the lights, plan your commute, or set your thermostat. If they ever give Alexa sudo, she might be able to make a sandwich. However, you almost always see these devices sending data to some remote server in the sky to do the analysis and processing. There are some advantages to that, but it isn’t great for privacy as several recent news stories have pointed out. It also doesn’t work well when the network or those remote servers crash — another recent news story. But what’s the alternative? If Picovoice has its way, you’ll just do all the speech recognition offline. Have a look at the video below. There’s an ARM board not too different from several we have lying around in the Hackaday bunker. It is listening for a wake-up phrase and processing audio commands. All in about 512K of memory. The libraries are apparently quite portable and the Linux and Raspberry Pi versions are already open source. The company says they will make other platforms available in upcoming releases and claim to support ARM Cortex-M, Cortex-A, Android, Mac, Windows, and WebAssembly. Like many of us, [Zoltan Toth-Czifra] has completely embraced 21st century living. His home is awash in smart gadgets and dodads, from color changing light bulbs to Internet-connected cameras. But he’s also got a soft spot for the look and feel of vintage hardware, like the rotary phone he keeps kicking around to remind him of the old days. He recently decided to bridge these two worlds by turning the rotary phone into a modern voice controlled assistant. The first piece of the puzzle was getting the old school phone connected to something a bit more modern, namely a Raspberry Pi. He didn’t want to hack the vintage phone apart, so he picked up a Grandstream HT801, an adapter that’s used to convert analog telephones to VoIP. [Zoltan] says this model specifically fit the bill as it had a function that allows you to configure a number to dial as soon the phone is lifted off the hook. This allows the user to just pick up the phone and start talking without having to dial anything manually. If you’re looking to pull off a similar setup, you should check to make sure the adapter has this function before pulling the trigger. With the rotary phone now talking a more modern protocol, [Zoltan] just needed to get the Raspberry Pi side sorted out. He installed a SIP server so it could communicate with the HT801 adapter, and then got to work putting together his virtual assistant. Rather than plug into an existing system, he rolled his own by combining open source packages for controlling his various smart devices with the aptly named SpeechRecognition library for Python. Right now he’s only programmed a few commands that his system can respond to for controlling his lights and music, but mentions that the system is modular enough that he can add new functions easily. He’s put the source for his virtual assistant framework up on GitHub, which he notes was written in less than 200 lines of original code by virtue of utilizing existing libraries for a lot of the heavy lifting. Open source is a beautiful thing. In the past we’ve seen rotary phones go mobile thanks to GSM upgrades and dragged kicking and screaming onto the modern phone network with a built-in Raspberry Pi. But we think there’s something especially appealing about the approach [Zoltan] took which preserves the phone’s original hardware. Bud Bennett has updated details to Precision Voltage Reference. Setvir has updated the project titled ARC. Gecko Biloba liked pcbtc (GaN edition). startup2018 wrote a comment on Automated Circadian Bathroom Light. morgan liked Bone transduction hearing aids. startup2018 liked Automated Circadian Bathroom Light.